I first met him in a crowded, balmy northern Jerusalem pizza parlor called “Borough Park”. He, Asher Nesher, was working behind the counter, gracefully fielding all incoming orders from the virtually exclusively Haredi (ultra religious) clientele. Over a sea of black hats, through a jungle of beards and accompanied by a cacophony of Yiddish-tinged Hebrew, I elbowed my way through. After all, while these good people of the Book rhythmically debated the virtues of mushroom versus onion toppings, I had to hustle on back to the Jerusalem Post building, to resume and complete the night shift as a fast typing monkey, paid monthly in peanuts and promises. We bonded over baseball. Wearing my “Think Blue” Dodgers t-shirt one bright, clear spring day turned out to be the precise brand of social lubricant that set Asher’s tongue in motion. Not that he knew a thing about the Dodgers specifically or baseball generally. The lure of America’s past time for Asher was of a practical rather than mystical nature. Centrally located in the bohemian fringe neighborhood of Musrara, Asher lived but a few feet from the Yoel Salamon strip of bars in downtown Jerusalem. The Lion’s Den was a watering hole in the area that was known for its multiple flat screens that broadcasted many American football, basketball and baseball games. The Lion’s Den was also known for its tanned, toned and generally luscious patrons. So, with the hopes of talking up a sweet-smelling UCLA co-ed on summer vacation who happened to bleed blue, Asher committed himself to learning everything about the Los Angeles Dodgers: history, stats, active roster, 40-man roster, depth chart, coaches, prospects, draft reports and more. As Asher’s guide through Dodger Stadium, Sandy Koufax and Shawn Green, I proved invaluable in helping him wake up one early Saturday morning next to a tanned, toned and generally dazed second year Gender Studies student from Westwood, California. Having aided and abetted a summer fling, our friendship was thus solidified. Asher and I next developed a Thursday night ritual, whereby we would hit a different pub each week. It was at Dublin’s that I learned that Asher was a self-proclaimed militant pedestrian who dreamt of a world where all streets were safely and comfortably navigable on foot. And it was at the refreshingly lo-tech Taklit, located right next to the Russian Compound, that Asher waxed political, asserting that the Knesset (Israeli parliament) may as well lower Israel’s national flag and hoist up Sicily’s in its place. “The cancer of uncontrolled corruption is poisoning the marrow of Israeli society,” Asher would reflect. “Black cholera on all of them!” he’d bellow whenever anger trumped resignation. And so it went. Working in a Soviet era mental institution left me emotionally and financially depleted. As such, I resigned my post from the Jerusalem Post and hitched my star to a rather shady Givat Shaul-based cell phone company. Located on the western outskirts of Jerusalem, Givat Shaul is best known for its cemetery, low-cost wedding halls and proximity to a psychiatric hospital. With funds for my Israeli expedition having dipped to alarming levels, I accepted with good natured resignation the position of human punching bag for perpetually outraged American parents. Besides, my fellow inmates were a motley crew, comprised of an immigrant from Moldavia, a computer science student from Ma’ale Adumim, a recently religious former Calgarian residing in nearby Har Nof and a surly Melbourne transplant who kept us in stitches with his under-the-breath obscenity-laden diatribes about socialists, Arabs and vegans. Asher Nesher completely dropped of my radar screen during these days of box wine and Bissli (Israel’s national snack). Relegated to “Jerusalem acquaintance – Musrara” in the files of my life’s Rolodex, it wasn’t until I was knee deep in the big muddy of my current job that I chanced upon Asher, on Highway 1 that connects Jerusalem to Tel Aviv. Having landed a gig that both covered the rent on my Mitudela Street apartment and left me with a bit to spare allowed me the luxury of exhaling – for the first time in months. However, this era of good feeling was temporarily dampened when those damned San Francisco Giants won the World Series – for the second time in three years. Happy thoughts of a Los Angeles Dodgers’ 2013 resurgence were just beginning to turn my grey matter blue, when an incessant honking snapped me out of the light stupor I had drifted into while gazing blindly out the window of the Egged 947 bus – my daily mode of transportation to and from work. 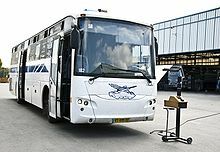 An Israel Prison Service vehicle, packed tight with society’s dregs, had pulled even with our bus and was moving at an acceptable clip – yet the driver continued to slash Sunday morning into bits with his blaring horn. Aroused into curiosity, I craned my neck the necessary smidge required to get a clear look at the unhinged driver. And off he sped, laughing out loud while hauling Israel’s leading carcinogens – tax evaders, money launderers, thieves, rapists and God knows who else – to their final dumping ground. Smiling as if lobotomized that morning, I couldn’t help but revel in Asher’s about-face, from bar hopping, skirt chasing pizza guy to a most respectable career in law enforcement. I vowed there and then to focus long and hard, wherever it took me, on realizing my life’s greatest ambition: to develop an ambition. Glad you liked the piece. Tell your friends about Jerusalem State of Mind! Feel good. Hi there, I enjoy reading all of your artocle post. I like tto write a little comment tto support you. I’m glad that you’ve been enjoying my posts. I’ll keep it up…if you tell your friends about JSM!